Places to Visit 1 Coffee Plantation in Coorg, Karnataka. 2 Enjoy the withering winters in glorious town of Jaipur. 3 Turtle festival at Vela, Maharashtra. 4 Yoga International festival (1-7 Mar) T Rishikesh, Uttrakhand. 2 Mapro Strawberry Festival at Mahableshwar, Maharashtra. As there are no long weekend in the month of July, but there are two wo must-see events that you can attend if you plan to take any leaves. One is the famous Champakulam Boat Race in Kerala and Jagananth Puri Yath Yatra in Orissa. Also July & August is best for the once-in-a-lifetime trip to Leh-Ladakh. Enjoy the beautiful scenic view of Nubra valley, Khardung La, Pangong lake, Leh gompas and Ladakh valleys. September also does not have any long weekends, however it is coming with the most culturally rich festival. Plan a trip to Gujarat to watch the colorful nights of Navaratri or plan to visit Mysore for its rich and glorious Dussehra celebrations or go to West Bengal and enjoy the sweetness of Durga Puja celebrations. 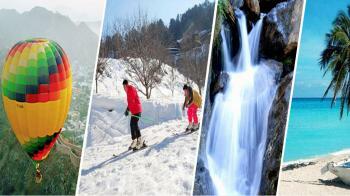 Places to Visit 1 Go Trekking to amazing places such as Uttrakhand or West Sikkim or Himalays. 2 This Time is best to get smitten by the Divine Natural Beauty of Sven Sisters, East India. 3 Go and get relaxation in old the Portugese Settlement of Pondicherry and get some fun in Goa. Although November does not have any long weekends, if you plan to take leave from schools and workplaces here are options that you can explore to visit – Hampi in Karnataka, Ujjain in Madhya Pradesh, Tarkarli in Maharashtra, Amritsar in Punjab, Ziro in Arunachal Pradesh and Kohima in Nagaland. 2 Bharatpur, Orissa to spot migratory birds.